Dark leafy greens are an important part of my diet. They keep my digestion moving and are a great way to get a healthy range of nutrients like magnesium, calcium, potassium, and B-vitamins. I shoot to eat dark leafy greens, in some form, every day. Each week I buy a bundle of chard, Lacinato kale, and 2 packages of organic baby spinach. I’ll eat spinach boiled with poached eggs in the morning, fresh in salads for the afternoon, and cooked into most meals for supper. Follow me on Instagram to get an idea of all the types of meals I add dark leafy greens into. I cringe when I purchase greens each week as I know how simple and abundantly they grow. Vegetables like chard, kale, spinach, and beets with their nutrient dense tops grow abundantly in the home garden and will keep you in fresh greens from spring to fall. What I especially enjoy about growing my own greens is that I’m able to use them immediately without losing any of the nutrients they hold. Most greens once picked, start losing their nutrient content fairly quickly. By growing them at home, you’ll get more vitamins and minerals and you’ll also have an abundance to freeze for the winter. I’m excited to get my garden beds filled with fresh greens this season! A great way to use dark leafy greens is to make a greek spanakopita. It’s rich and creamy with an abundance of savory flavors. To make a typical spanakopita, one usually uses thin phyllo sheets for a layered pie. 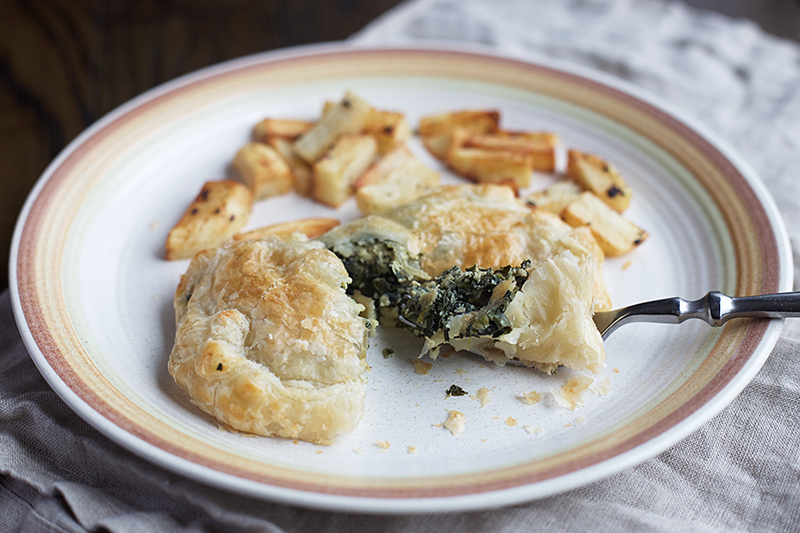 With puff pastry in hand, I decided to make spanakopita pockets with a crunchy, flaky crust. Make sure your puff pastry is free of preservatives and chemicals. You can find it at most Whole Foods, Natural Grocers, and at Trader Joe’s over the Christmas season. Of course, you can make it at home too. Spanakopita pockets, savory and creamy spinach filled pockets, are a delicious way of getting dark leafy greens into your diet. In a large pan, gently bring 2 tbls of olive oil to medium heat. Add the onion, garlic, salt, and pepper and saute until the onions are soft and translucent. Add the spinach with a splash of lemon juice and mix through until the spinach begins to soften and wilt. To the pan, add the eggs, ricotta, and feta. Cook until the cheese has melted and incorporated into the spinach. Stir the mint into the spinach mixture. Remove from the heat and transfer to a bowl. Remove one sheet of defrosted puff pastry and cut into 4 equal pieces. Keep the other sheet in the refrigerator until ready to use. Fill each piece with 3-4 tbls of spinach mixture and form into a pocket, sealing the edges with your fingers. Place on the parchment lined baking sheet. You'll want to move quickly as the puff pastry gets sticky as it warms. Once all the spanakopita pockets have been made, brush the top of each pocket with the whisked egg for a golden-brown top. Bake at 400F for 15-20 minutes or until puffed and browned. These freeze really well. Once frozen, pop them into a 375F oven for 15-20 minutes. Do you make sure to get dark leafy greens into your diet regularly? Share in the comments below some of your favorite ways to use dark leafy greens.